File contains a piece of correspondence from Helmut Türk, who was at the Ministry for Foreign Affairs in Austria, discussing the upcoming meeting of the International Seabed Authority in Jamaica. 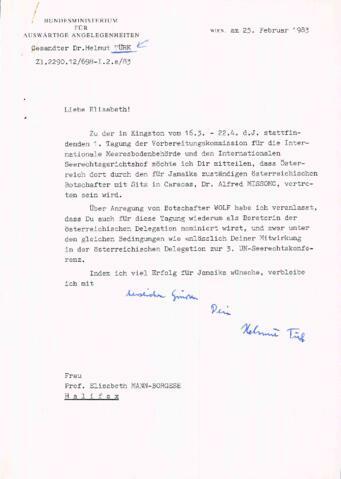 Also includes a brief note from Elisabeth Mann Borgese to Türk, on an upcoming meeting in Vienna. File contains German and English language correspondence.